What’s wrong with my pine tree…? Nothing! Every once in a while in this line of work we’re actually able to give a homeowner some good news about their trees. A case in point is a call that we frequently get this time of year that starts like this: “My pine tree looks like it’s dying! It’s dropping all of its needles!” If the caller has access to the internet and a digital camera I usually request that the send me a couple of photos; if not, I ask them whether the tree is shedding needles along the outermost part of the limbs or on the interior. 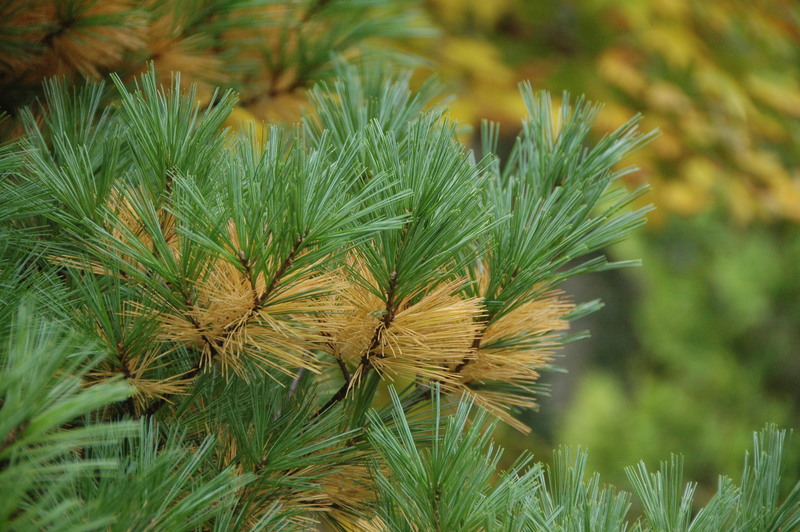 White pine trees often grab homeowners attention as they begin to drop their needles in the fall. In the vast majority of cases the tree is an eastern white pine (Pinus strobus) and the homeowner is observing is normal needle shed. 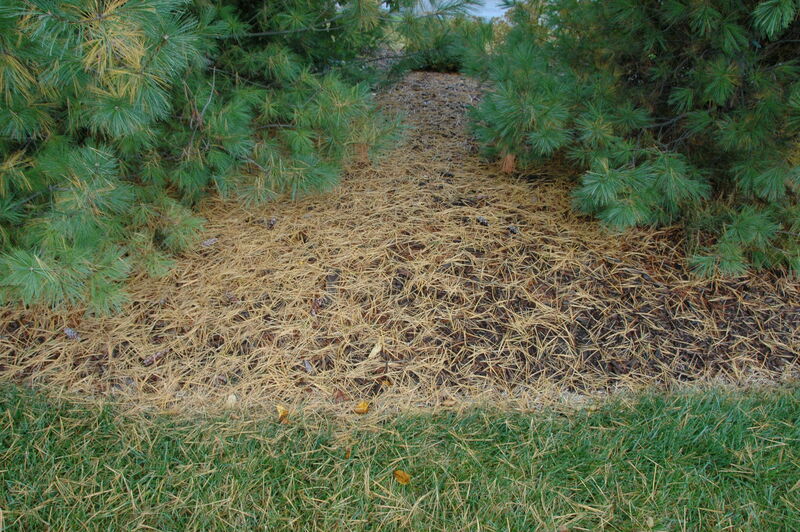 White pine needles often persist for only two growing seasons. So in the fall they begin to shed their previous-years needles, which often turn an eye-grabbing bright yellow in the process. Actually all pines and evergreen conifers shed their needles; it’s just more noticeable in white pines because they are common in the landscape and their needles are short-lived. 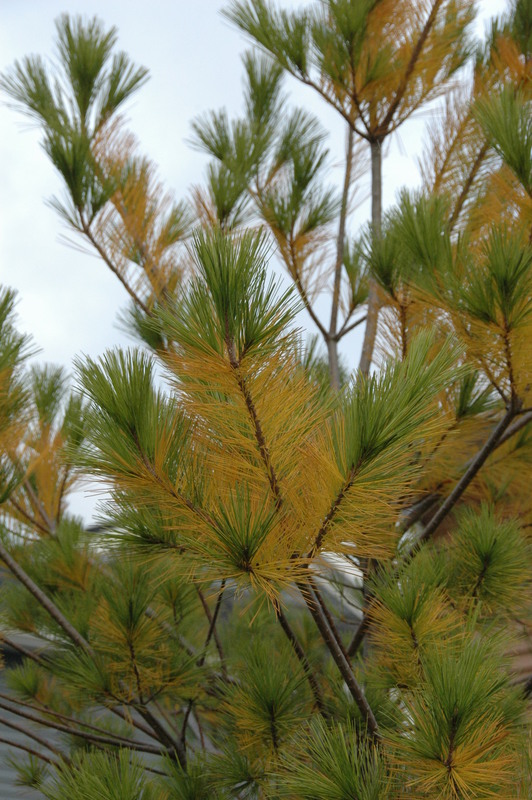 White pine needles often turn bright yellow as they senesce. What’s wrong with my pine tree? 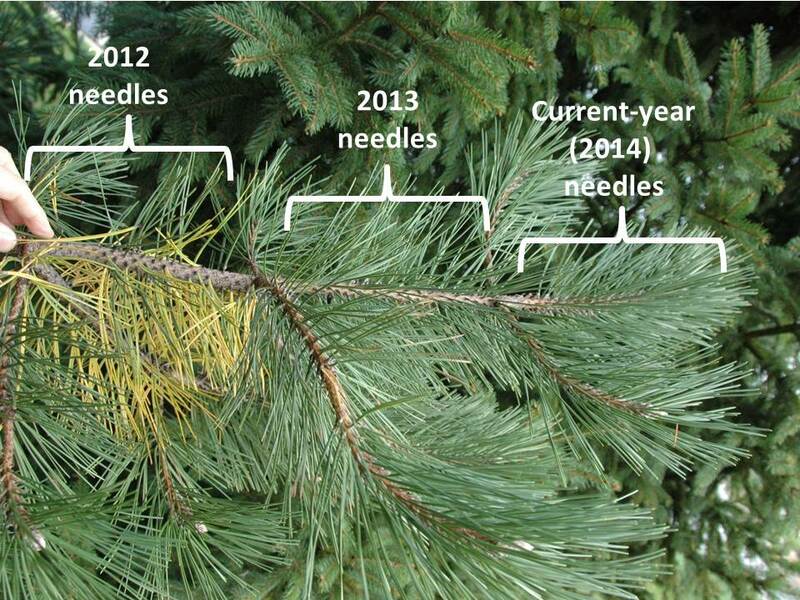 As long as the tree is dropping older (interior) needles, it’s probably normal needle shed. The lifespan of pine needles varies widely among species. In some species, such as white pine and loblolly pine (Pinus taeda), needles may only persist for two growing seasons. On the other end of the spectrum is bristlecone pine (Pinus longaeva), which can retain needles for up to 40 years. For the most part, needle retention is correlated with shoot growth rate; trees with fast growth rates have fast needle turnover, while slower growing trees have long needle longevity. Of course there are lots of exceptions to this trend and environmental conditions can impact needle life-span as well. For example, needles may shed prematurely during a drought. Needles on this Austrian pine (Pinus nigra) persist for three growing seasons. The tree is currently shedding needles formed in 2012. Bottom-line: If it’s fall and your pine is starting to drop interior needles, chances are it’s normal needlefall and nothing to worry about. Pine needles accumulating on the ground. Hennessey,T.C. , P.M. Dougherty, B.M. Cregg, and R.F. Wittwer. 1992. Annual variation in needle-fall of a loblolly pine stand in relation to climate and stand density. Forest Ecology and Management. 51:329-338. Schoettle, A.W. 1990. The interaction between leaf longevity and shoot growth and foliar biomass per shoot in Pinus contorta at two elevations Tree Physiology 7:209-214. 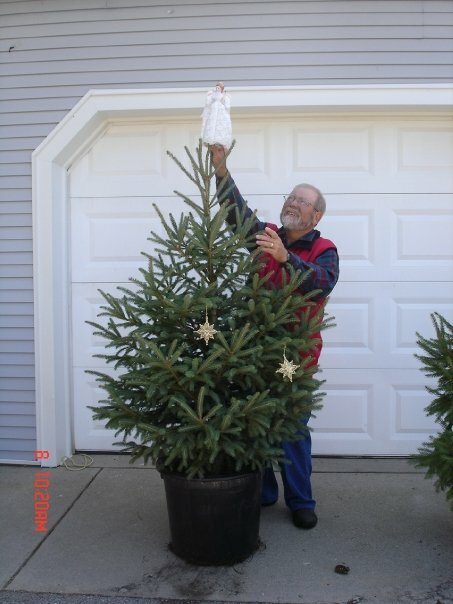 Posted on October 5, 2014 Author Bert CreggCategories Bert Cregg, What About the TreesTags conifer, woody19 Comments on What’s wrong with my pine tree…? Nothing! One of my ‘other duties as assigned’ this time of year involves serving as The Christmas tree Guy and responding to various media inquiries about Christmas trees. Last week I posted a link to a media story about Christmas trees on the Garden Professor Facebook page. That post drew a response from Kyle Fletcher Baker who derided cut Christmas trees as “murder of the innocent.” My initial reaction was, “Jeez, Kyle we’re talking about fir trees here not lamb chops or veal.” But Kyle’s post serves as a reminder that there are many people that object to cutting trees for Christmas decoration – no word on how these folks feel about cut flower arrangements but that’s another story. In some cases this objection stems from the belief that Christmas trees are cut from native stands of trees. 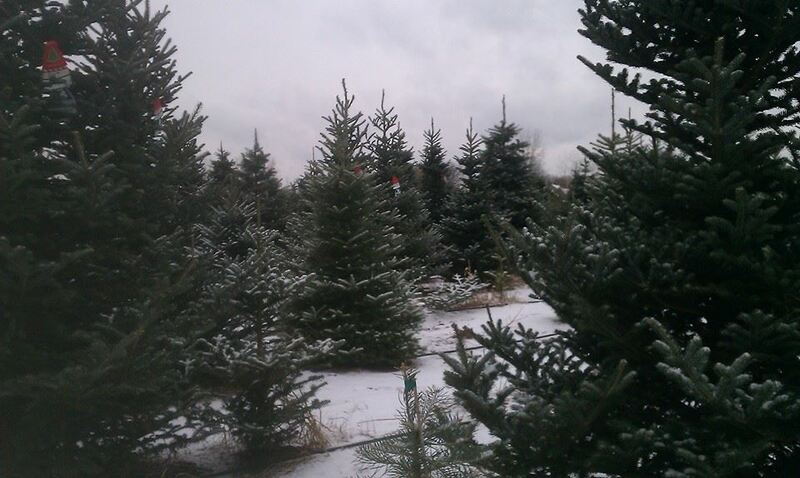 In fact, virtually all Christmas trees sold at tree lots are grown on tree farms for that expressed purpose. There is also a sizable portion of the population that believe artificial trees are more environmentally responsible than using a live tree. My personal opinion is this is a fairly small factor in most people’s tree buying decisions but the question persists and seems to get a lot of media play. The American Christmas Tree Association (a trade group that represents artificial tree retailers NOT tree growers) commissioned a life cycle analysis (LCA), which estimated cradle-to-grave carbon footprints for real and fake trees. The bottom-line of the study is that the impact of both is negligible. The tipping point is how far you drive to get a real tree each year and how long you keep your artificial tree. If you get your real tree close to home or combine getting your real tree with other trips, the carbon footprint of the real tree comes out better. But if the thought of cutting a real tree is still more than your conscience can bear, there is a third option: a living Christmas tree. 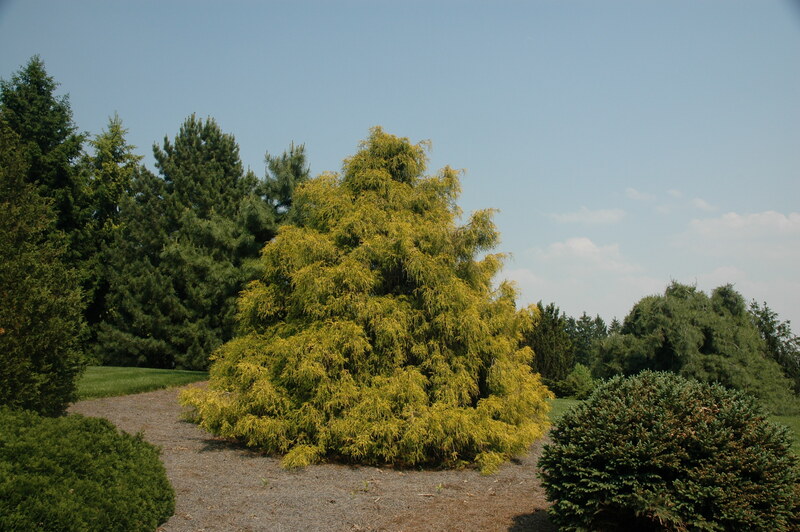 Many nurseries and Christmas tree farms offer container-grown or balled-and-burlapped trees that can be planted outdoors after the holidays. 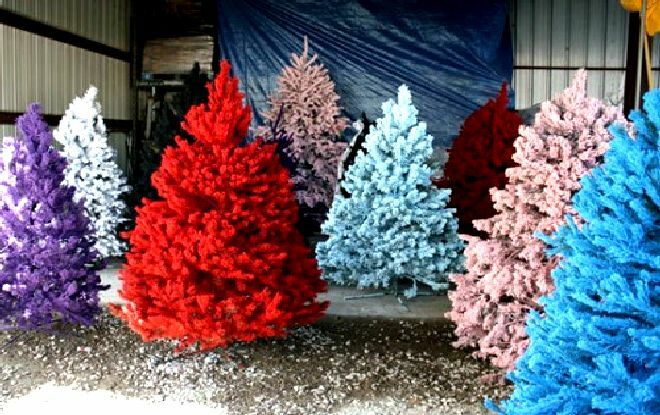 There are even companies springing up on the west that specialize in live Christmas tree rentals. These companies bring a tree into your house and then pick it back up after the holiday. Some will offer a certificate that the tree will be planted in a park or national forest after its display. Why are we interested in these species? 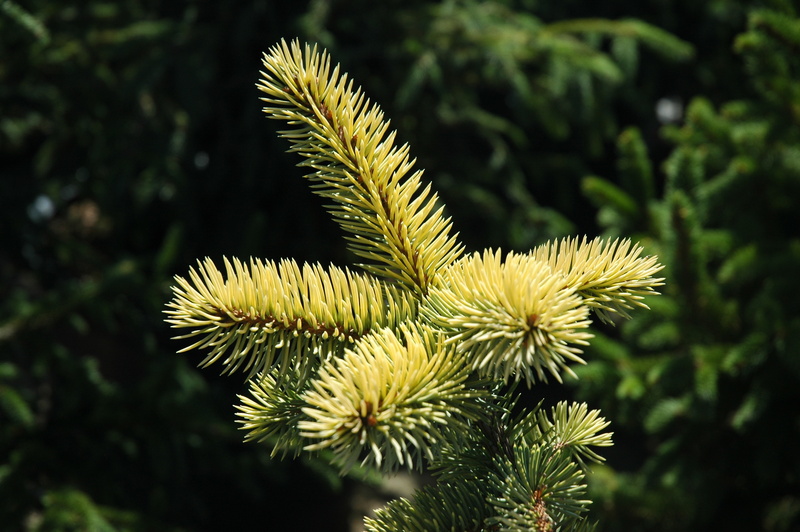 Both Turkish and Trojan fir are closely related Nordmann fir, which is widely used as a Christmas tree in Europe. These species make wonderful Christmas trees due to their symmetry and needle color. 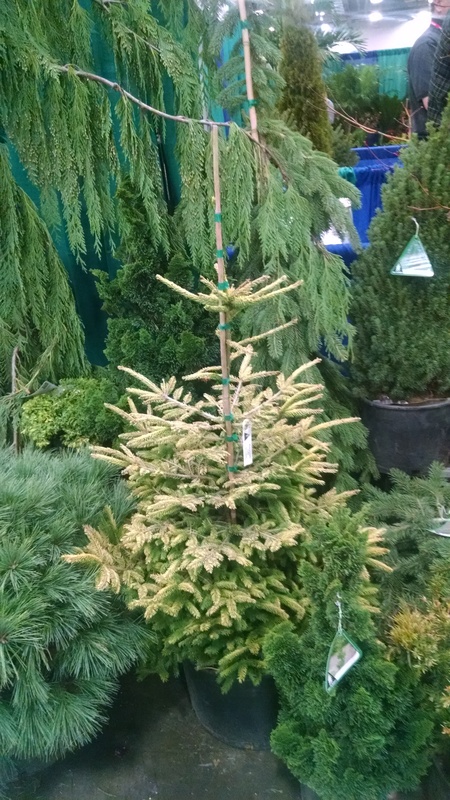 In addition they may be resistant to diseases, particularly Phytophthora root rot, that plague Christmas tree growers from Washington State to North Carolina. So, what was going on in Oregon? After the seed were collected in Turkey they were sent to Kintigh’s nursery near Eugene, Oregon, where the seed were sown to produce seedling plugs. The next step of the project will be to send the seedlings out to cooperators in five locations (Pacific Northwest, Michigan, North Carolina, Pennsylvania, and Connecticut). This is tree improvement on a grand scale. In each region there will be two test plantings and each planting will include 30 reps of 100 seed sources or 3,000 trees. Multiplied by 5 regions and 2 plantations that’s 30,000 trees total that we will collect data on for the next 8-9 years. I visited about ten sites last week with an applicator that had used Imprelis this spring. The landscaper was a certified applicator with about 15 years of experience with herbicides, insecticides and fungicides, who was knowledgeable about his chemicals and plants. We saw bout 50 trees, mostly pines and spruces with varying levels of injury. The typical symptoms were brown or off-color needles, and stunted or twisted shoots. Damage was mostly limited to the current flush of growth, resulting in a distinctive pattern of growth. In many cases, there was evidence of spiral movement up the trunk of the tree. The most rapid growing points (usually terminal leaders) were most severely affected. Based on my experience with other forms of herbicide injury and other types of environmental damage, I suspect all but the most severely injured trees would recover is given enough time and some corrective pruning. The problem, of course, is that most homeowners don’t want to wait around while the tree in their yard tries to rally. The $64 question now becomes, “What happened?” In order to receive registration from the US EPA, each new herbicide has to go through extensive testing. According to DuPont, over 400 tests were conducted with Imprelis. Despite some claims elsewhere on the internet, this testing included independent university trials on spruces and pines at up to 4x the labeled rate. The key to unlocking the mystery of Imprelis injury will probably lie in understanding how conditions in actual application conditions differed from the testing. Gall adelgids are certainly a problem in these parts, especially on blue spruce. But the ‘problem’ in this case is not a pest. This year, as in several recent years, spruces are developing copious amounts of pollen cones. Once the pollen is shed, the cones dry up and turn brown. Many homeowners mistake these for insect galls or sign of some other pest activity. In many conifers, pollen cones occur on the lower portion of the crown while seed cones occur in the upper third as an evolutionary adaptation to reduce selfing. We’re beginning to see signs that we may be getting a lot of calls on spruces this year similar ones we experienced a couple of years ago. 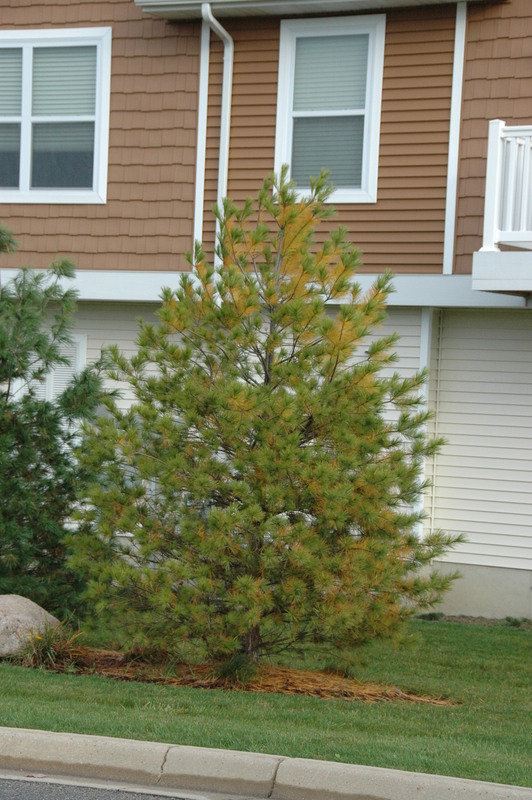 Homeowners and landscapers are calling in with reports of brown ‘growths’ on spruces – particularly white spruce and some on Colorado blue spruce. The growths can be quite noticeable, even from a distance and cause trees to take on a brownish cast; usually most prevalent on the lower 2/3rds or so of the crown. What’s going on? Note: I also discuss this problem in my article in this week’s MSU Extension Nursery and Landscape CAT Alert – but don’t go there ‘til you’ve chimed in here. Otherwise we call that ‘not in the spirit of the challenge’. Posted on April 30, 2010 Author Bert CreggCategories Friday puzzleTags conifer, woody11 Comments on Friday Quiz: Spruce brown-out? One of the roles I’ve evolved into over the past decade as an extension specialist at MSU is that of ‘the Conifer Guy’. Conifers are great and fascinating plants. The oldest trees in the world are conifers, the largest trees in the world are conifers, and some of the most interesting (at least to me) landscape plants are conifers. Unfortunately, for a variety of reasons, in the Upper Midwest we have gravitated to Colorado blue spruce more than just about any other conifer. Part of this over-reliance on blue spruce in the landscape is driven by production (see, Linda, I’m not always an apologist for nurseries). Growers want to grow what they know and what’s easy to grow. As a nursery tree, blue spruce is a reliable performer that is well adapted to a relatively wide range of site conditions. 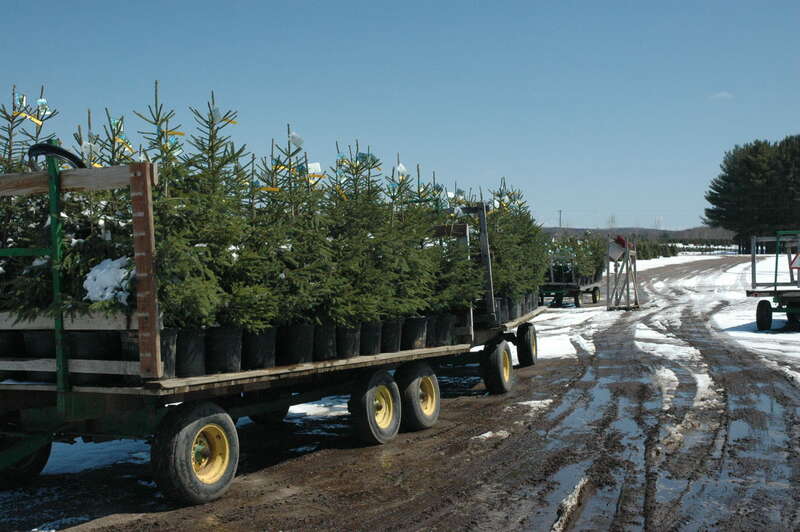 Of course, growers also want to grow what they can sell, and there always seems to be a steady demand for blue spruce. In many neighborhoods it appears that there is an ordinance that every other tree has to be a blue spruce. So what’s the issue? In the Great Lakes region, blue spruce often look pretty good when young. However, as trees age they become susceptible to several major pests, especially cytospora canker and gall adelgid. So all those shapely blue Christmas trees that were planted 10 or 15 years ago are now a bunch of ratty-looking messes. So what’s the solution for blue spruce burn-out? 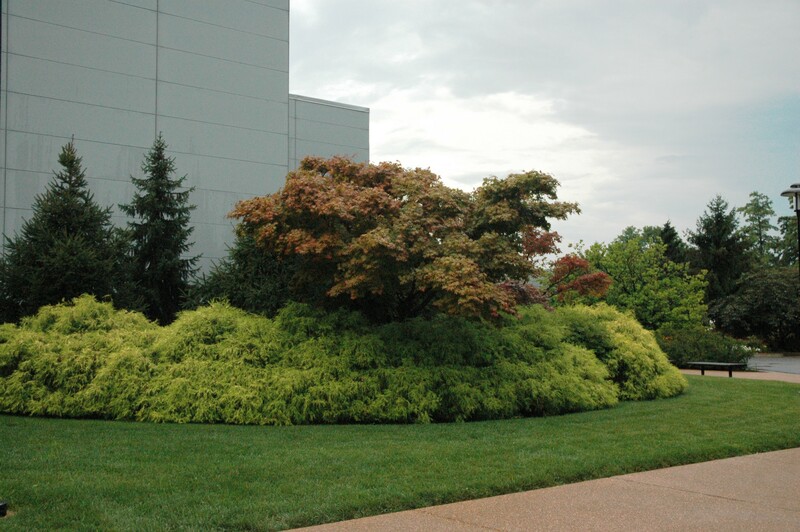 Clearly landscapers and homeowners need to think beyond blue spruce and look for a greater variety of choices. Here are three to consider. – Serbian spruce Picea omorika Whenever I’m asked to suggest a conifer, Serbian spruce is usually one of the first trees in the conversation. 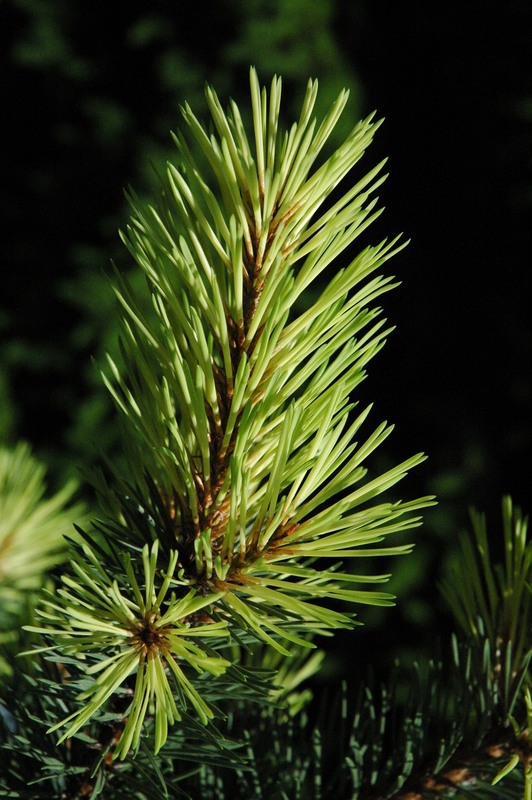 While the color may not be as striking as a blue spruce, Serbian spruce still has impressive needles in its own right – bi-color with dark green on the upper side and silver below. Adding to Serbian’s charm is its graceful weeping habit. – Swiss stone pine Pinus cembra The late, great conifer expert Chub Harper used to remark, “I never met a cembra I didn’t like.” Chub’s fondness for Swiss stone pine was well founded. Here is an understated, consistent landscape performer. Few pests, dark green needles and stately upright form. 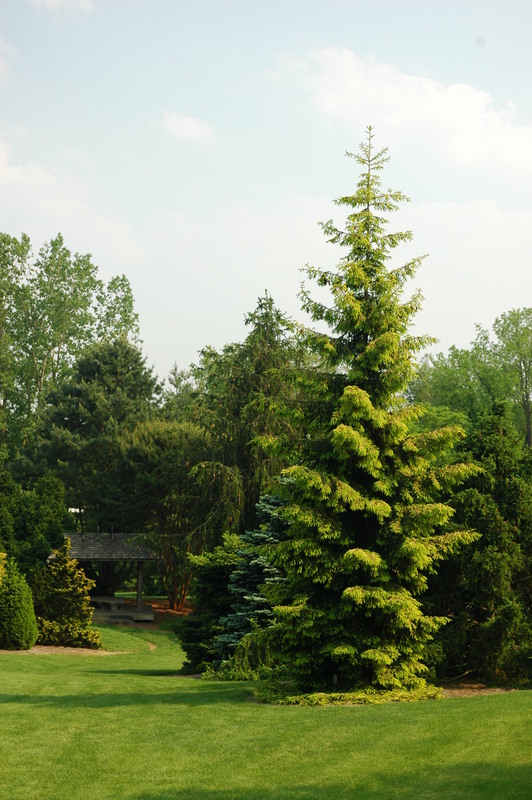 – Korean fir Abies koreana It would be a stretch to consider Korean fir an alternative to blue spruce. While Korean fir is more broadly adapted than many of its pantywaist cousins in the genus Abies, it will still do best on the Holy Grail of moist, well-drained slightly acidic soils. Nevertheless, Korean is tougher than the average fir and is a conifer with some character and worth a shot. Korean firs are often heavy cone producers, which can add an interesting element of color.